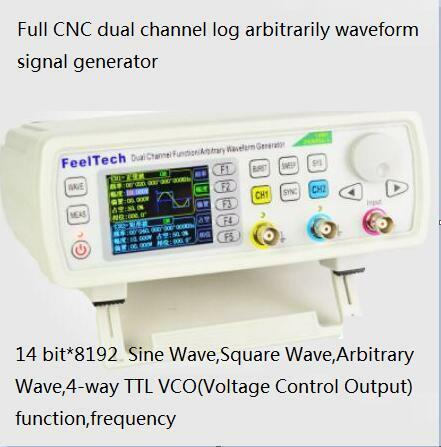 I was going to buy a cheap Feeltech, but some have reported that its lack of proper grounding is allowing voltages of around 90 volts at 1 milliamp to run through the probes. Concerns have been raised about connecting it to mpus and such. So I was kind of resigned to swapping out the internal power supply for something better, which is expensive and bothersome. Then I came across this thing - an 'RD JDS6600 Series 25MHZ Digital Control, Dual-channel, DDS Function Signal Generator/frequency meter Arbitrary sine Waveform' thingie. Let's see what I remember. A full color LCD display on the front. Power through a wall wart, so no high voltage transients running around. Some very nice software that appears to do a lot more than the remote control software for the Feeltech. A whack of pre-programmed waveforms, most of which have names I don't recognize. 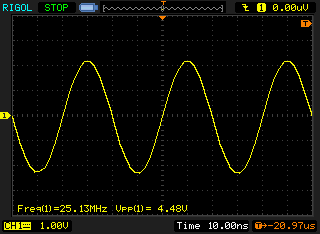 A proper sine wave up to 25Mhz. 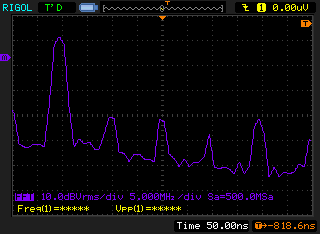 And apparently some decent square and triangle waves up to 15Mhz (the feeltech crapped out around 4Mhz). The ability to store up to 60 different user defined waveforms, as well as sample an incoming wave form. Dual channel outputs. There are a ton of specifications on the site. I won't pretend to know whether they're significant. I'm hoping you folks do. They want $140 Canadian including e-packet shipping (which is pretty fast). The Feeltech was $85, plus whatever I have to do to solve the voltage transient problem. I have the impression that this thing is somewhere in between the Feeltech cheapie, and a name brand signal generator from Rigol et al. I'm leaning towards buying one. I'd sure appreciate feedback from all of you. Or any of you. Re: Anybody know anything about this signal generator? There's no audio - not even a muzak track - but you get a closeup of the face of the unit being manipulated by what I suspect are Chinese hands. Sure seems to do a lot. Well, I guess we'll all find out together! I've ordered it from AliExpress, and they'll be shipping via e-packet. So I should have it in about 3 weeks. When it shows up, I'll share my experiences here. Take care, all. Hope this works! Perhaps you could link him to some of your teardown or review videos to help him better understand what you are asking for. I've been planning a YouTube channel for about a year - or more - now. I have a lot of cool DIY projects that center around 3D printing, and a lot more - like a review of the JDS 6600, and an updated review on the Korad power supply - centering around electronics. With my Wriggle DS1054Z arriving tomorrow, I'll have a decent scope to test them on. I'm also building a really simple UV contact printer to allow me to make some PCBs. So there's a lot of topic material there. Yes, I'll be doing a bit of a teardown on the 6600 when it shows up - at least enough to show people what's in the case - and some decent testing of the signal quality vs frequency. I'm not expecting a great deal, but i hope that it's better than Feeltech. I'll be disappointed if it's not. I ordered one of these about 10 days ago. According to Canada Post, they received it a few days ago, but haven't done anything with it. However, the unit is on sale right now. I paid $136.86 CAD; the current price is $123.50 CAD, so maybe 10% off or so. Or a little more; I think their regular price was $140 CAD, but I got a few bucks off for being a nice guy. Heh, heh. Little do they know. Anyway, mine hasn't arrived yet, so I can't endorse it. But for any one who was on the fence about ordering one, you can get it for 10% off right now. It's also worth noting that they've introduced several new models; they now claim a new high frequency of 60Mhz on their most expensive model. This is for a sine wave. For square or triangle waves, they claim a maximum of 15Mhz across the board, for all their models. I don't believe the 60Mhz claim. I'm sure there's something there, but I'll bet it winds up looking like a weak, wobbly triangle wave than a pure sine. Anyway, for someone interested in checking it out... there it is. It's a bit rough, should have taken a look at the high-frequency performance; but there might still be something in there that's useful for anyone thinking of buying. If anyone's got any tests that they're specifically interested in I'm happy to see how it performs and post the results here..
An FPGA and R2R ladder DAC is rather common for the low cost Fgens. 1) Noise, e.g. 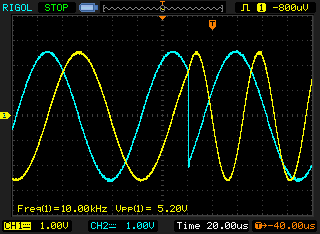 from the SMPS or just from the DAC: So maybe use just a DC or low amplitude sine. 2) DAC linearity: This can usually be seen from a slow triangle / ramp. 3) Output amplifier slew rate: Many similar low cost generator run in to a slew rate limit with full amplitude and high frequency. So usually the maximum amplitude is reduces at the highers frequency. 4) There are 2 relays per output channel. So this could be an output attenuator. 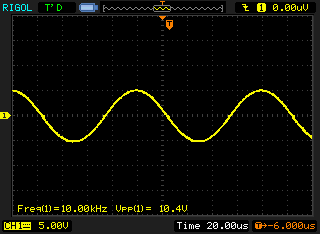 This has good sides, but might also limit the Offset range, when using low amplitudes. I bet this device is nearly identical to the MHS-5200A (and higher versions), except that it has the much nicer screen (and perhaps better UI). Hopefully we'll see a basic teardown soon. Interesting, I've haven't torn down a cheapie Fgen like this before so that explains that. I Actually just find out this today while searching for budged DDS gen..
actually they look almost identical..
One of reviewer said that this model uses Altera FPGA Cyclone IV, but never showed the internal boards..
1. 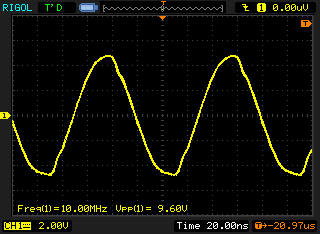 Set 10 KHz sinewave with 20 Vpp/maximum amplitude on an oscilloscope with 1 Meg impedance. 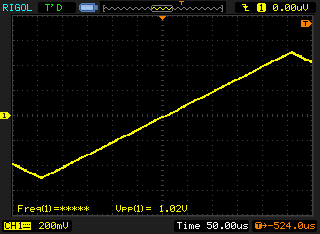 Then add the 50 Ohm termination and see if the output drops to 1/2 or if clipping or distortion starts happening. 2. 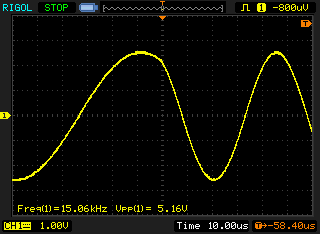 Set a 10 Vpp 100 kHz sinewave on the output into oscilloscope with 50 Ohm termination. 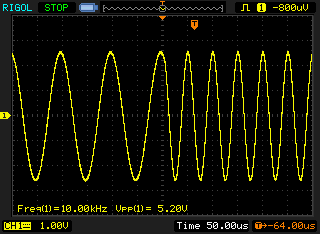 Then increase the frequency until maximum frequency to see if or at what frequency it starts distorting horribly. 3. 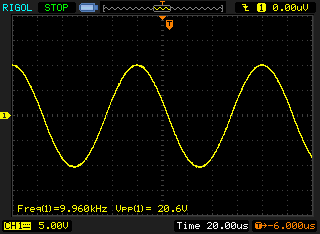 Set the generator to 5 Vpp, 10 kHz sine wave and then step change the frequency to 20 kHz. 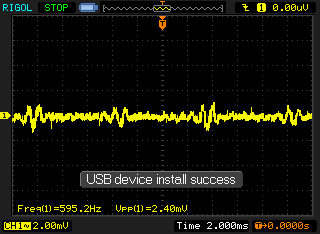 Try to capture on the oscilloscope the moment when the frequency changes. If you have advanced triggering I set trigger width must be < 20 uSec and then set to capture once. When you use two channels both outputting the same frequency sine wave with the phase 90 Deg apart it would be great to repeat test 3 to insure that both channels change frequency at the same time and with no glitches. 4. 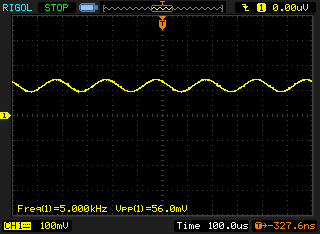 Repeat test 3 but with two sine wave channels outputting sine waves with 90 Deg relative phase. 5. Can you set the generator to output 2 sine waves with 90 Deg relative phase and then sweep the frequency such that both channels sweep in frequency and stay in phase lock? In advance I thank you for any of the above tests that you could do and report back results. 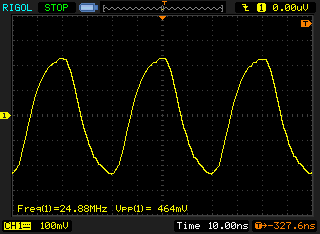 The triangle waveform looks quite good - better than I remember from the MHS5200. However the scope setting is not that good to tell if the little nonlinearity is from the scope of from the generator. If would need a zoom in on details of the slope and maybe an even lower frequency. 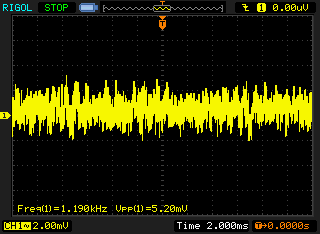 Usually a simple R2R DAC would show visible errors near the center or 1/4 of the range. There are 2 pots for each channel so these might be for adjusting at least that largest error. The picture of the circuit is just to bad in resolution to read the chip numbers. The output amplifiers might be interesting. For the rest I would expect an AD603 or similar for the amplitude adjustment. Are the USB and TTL I/Os isolated from the normal outputs ? It does not look like. Huh, interesting. Thanks for the link! So I think there are 2 interesting points here, at 10MHz and at 25MHz. 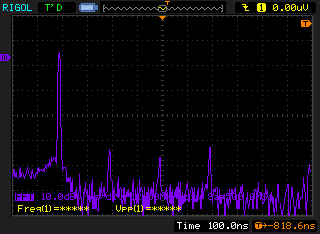 Because above 10MHz the amplitude is restricted down from 20Vpp to 10Vpp (probably for slew rate reasons). So that second harmonic is at about -30dBc, which is out of spec (Spec says -40dBc). Looks to be about -40dBc, so that's roughly in spec. As far as I can tell it's not possible to do sweeps on 2 channels at once. All good points, if I get some time later I might try a super-low frequency and use the datalogging feature on my keysight DMM to get some more precise measurments of that. Strange, I can read most of the chip numbers except a couple on the left - if you go to the raw link it should be a higher resolution than what you're seeing on the forum. 1. An AD8056A 300MHz voltage feedback amp. 2. An AD835 250MHz 4-quadrant multiplier. 5. A TI part, 3001I. I'm assuming this is the THS3001, which is a 420MHz current-feedback amplifier. The chip between the FPGA and TTL I/Os is just a 74HC14 hex inverter, so probably not. That is the "well known" WCH CH340G. 1. Looks like they got the output buffer "strength" right this time. The MHS-5200 had too small a power supply voltage to reach full 10 Vpp across 50 Ohm and the FY3200 buffer had to low a current limit. So, the JDS66000 is definitely improved here and from your photograph it looks like a reasonable heat sink. 2. Looks like some slew limiting on the output at 10 MHz but not too bad. The official specs say 20 Vpp up to 10 MHz, 10 Vpp 10 - 30 MHz, and 5 Vpp > 30 MHz. These specs imply a slew limit of just better than 5V0-p*2*pi*30MHz = 942 V/uSec. Probably around 1000 V/uSec which is pretty good. 3. Changing single channel frequency looks to be smooth which is good. "I couldn't find a way to change the frequency of both channels at once, so I'm not sure if that's possible"
4.4.2 Sync: When sync, CH1 is the object of operation. CH2 parameter will be changed with the changes of CH1 parameter. When the sync item is selected, you can press or knob to select the sync item needed, press ON softkey to select and press OFF softkey to cancel. Could you check for the system setting sync function and try changing the frequency of two channels locked at 90 Deg phase again? Again, thanks for your help in evaluating this generator and sharing. The parts used seem to be a little more expensive (e.g. AD835 instead of lower cost AD603) than those in the super cheap versions. The amplifiers also look rather fast. Still strange that there are additional AD8017. I finally found the higher resolution pictures. So I got a look at the DAC: they seem to use 15 lines in a thermometer style to get the upper about 4 Bits with less errors / glitches. So the DAC is not just an R2R ladder. sorry, because the english is not good, so we just show the operation and test result . I guss those don't affect our product ..
quality is very importanct as our life, you can asy"you don't believe" , but our data is real, only you test it , you have right to say those words, ok?